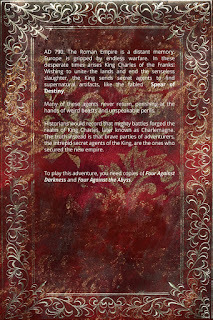 From cover to cover, it is 44 pages, and requires two of the core books to play, the original Four Against Darkness and Four Against the Abyss, written by Andrea Sfiligoi. The reason is that the party starts at 5th level, so all the rules in Four Against the Abyss come into play, such as expert skills, madness, lycanthropy, hirelings etc. 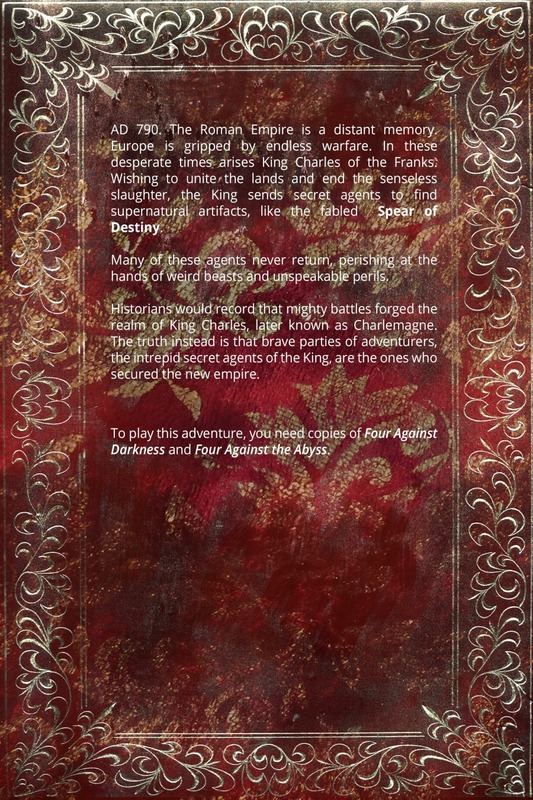 I really love the additional things Four Against the Abyss brings to 4AD, and this adventure has been developed with those rules in mind. 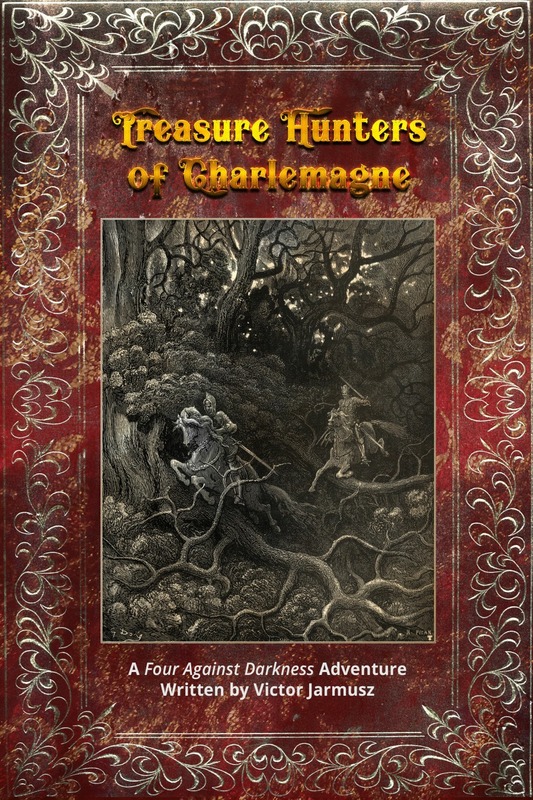 Treasure Hunters of Charlemagne is set in Europe in the late 8th Century. You use a party of 4 characters which can be of any class, except for elves, dwarves and halflings. Despite being in a real world setting, it is outright fantasy, so you still have wizards with all their spells, clerics, barbarians, rogues, warriors and swashbucklers. Inspiration is drawn from mythology of the time and works such as chanson de geste. The world is full of mythical beasts, enchanters, and magic items. 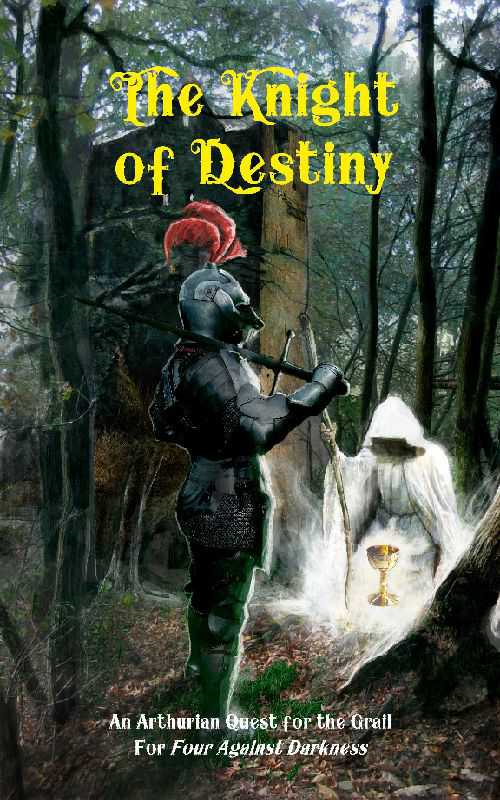 It is also full of deceit and intrigue, some of which makes its way into this adventure. 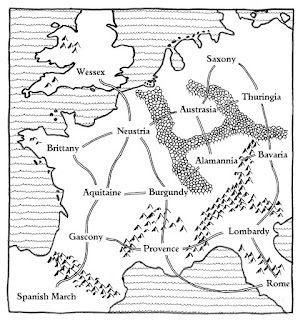 The game takes place on a map of Europe. You decide which areas to travel to. Each area has its own fixed encounter and background, so you have a lot of control in the path taken and developing the unfolding story. The campaign is not meant to be scripted, there is no one correct answer. Many different paths that can be taken to achieve the end goal. Random encounters happen as the party travels around Europe from place to place, from things jumping out of forests and mountains, to bustling towns. The game is meant to play like an "edited highlights reel", where sometimes you travel without incident, at others all manner of things start to go wrong. Towns are very important, it is here where a party gets to recover and engage in other activities; there might be a jousting tourney for warriors, thieving opportunities for rogues, wizards might try to track down ancient books for spells and clerics pray in a monastery. You might also bump into interesting people and hire some help. Things can also go terrible wrong here, such as characters getting into drunken brawls and even be arrested. Another aspect I wanted to model was party unity, or fellowship. Unlike a one-off dungeon bash, here the game could represent many months of travel, so keeping the party motivated becomes an issue. The party will face tests of its fellowship, that could see a character storm off! 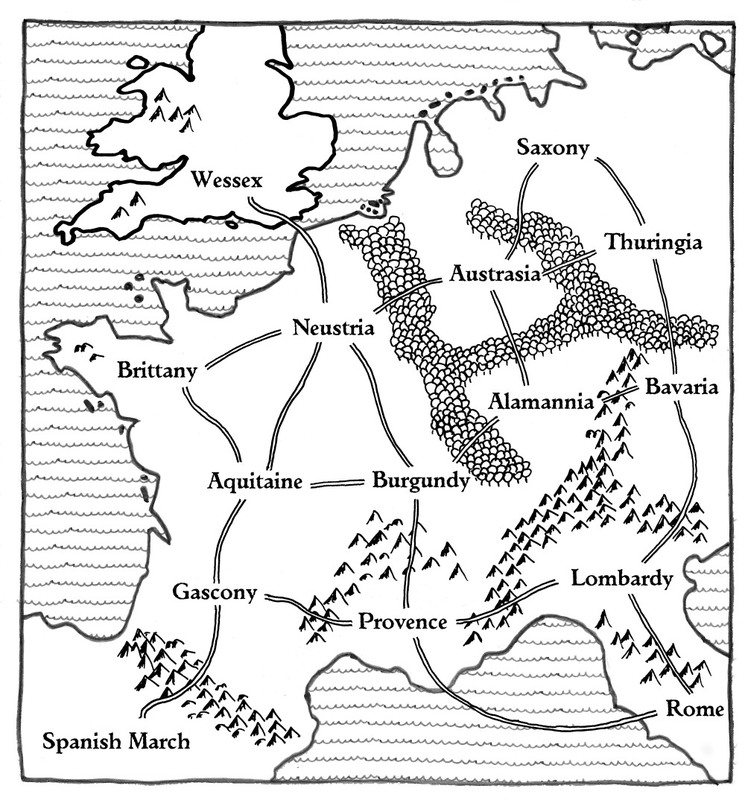 The ultimate aim is for the party to find clues, survive all the various challenges, including political and other intrigues that may be thrown its way to recover the spear of destiny and deliver it to Charlemagne. No doubt that once this happens, new chapters will be added to the chanson de geste! Hey Victor! I bought 4AD and 4AtA last week just to be able to delve into your fascinating adventure. 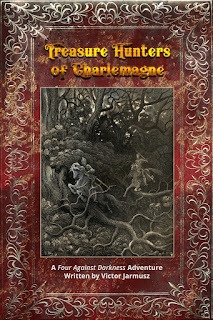 I love a narrative experience that mixes history with fantasy and as the historical period of Charlemagne is one of my favourite so I just couldn't resist. I would love to go right into the adventure but I guess I'll have to learn the base system first. Thanks! It does seem to be a neglected period, but very rich in mythology. The 4AD system is quite simple and provides a good base for combats, magic etc.